CarGurus has 50,916 nationwide F-250 Super Duty listings starting at $1,995. Feeding off its best-selling half-ton F-150 full-size pickup line, Ford Motor Company offers the same rugged styling, potent towing power and state-of-the-art techno-bling in a three-quarter-ton beast of burden with the 2014 F-250 Super Duty. All the bells and whistles, not to mention 3-to-6-passenger capacity and a pair of bed lengths come with this muscled-up version of the F-Series, while the variety of trim accoutrements once again assures an all but individually customized workhorse for your toting needs. After some serious tweaks in 2013 to trim choices, ride comfort and fuel efficiency, this year’s F-250 lineup sports no changes of note, except for some minor tweaks to options packages. Five trim levels once again are slated to be packaged into 3 cab configurations. The base XL and the up-featured XLT are both offered in all cab and bed configurations. The quasi-luxurious Lariat, meantime, is offered only in SuperCab and Crew Cab garb, while the uniquely brutish King Ranch and the elegantly top-shelf Platinum are delivered only in Crew Cab editions. Regular Cab trims seat 3, while the SuperCab seats 6 and features rear-opening back doors, and the roomy, 6-passenger Crew Cab offers the traditional 4 independently opening doors. Meantime, a pair of bed lengths, the standard 6.75-foot length and the 8.25-foot long bed are expected with both the SuperCab and Crew Cab trims, while Regular Cab editions carry only the 8.25-foot long-bed. A standard 6.2-liter Flex Fuel (FFV) V8 gasoline engine should again be delivered with all 2014 F-250s and likely mates with a 6-speed shiftable automatic transmission for 385 hp and 405 lb-ft of torque. 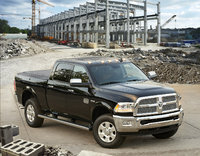 Towing is maxed out at 12,500 pounds, but again mileage estimates are kept hush-hush, though doubtless won’t be pretty. Once again optional in this year’s F-250 lineup is a 6.7-liter turbodiesel V8 powerplant that remains under the management of the 6-speed shiftable automatic and puts out 400 hp and an impressive 800 lb-ft of torque. Towing figures for the diesel-equipped variations are maxed out at 14,000 pounds with the standard hitch and wiring combo, while available fifth-wheel/gooseneck towing capabilities jump to 16,800 pounds. Maximum payload capacity, meantime, is topped out at 3,780 pounds. Finally, in keeping with tradition once more, this beast is offered with standard rear-wheel drive (RWD), but all trim levels can be equipped with available part-time 4-wheel drive (4WD) that features manual or electronic hi-lo gear selection, auto-locking hubs and an electronic locking rear differential. Base Ford F-250 Super Duty XL trims should once more sport few amenities, with Regular Cab versions likely featuring 17-inch steel wheels and a trailer hitch and wiring outside, and vinyl upholstery, telescoping tilt-wheel steering and air conditioning inside. Standard entertainment goodies, meanwhile, doubtless remain only an AM/FM stereo with 2 speakers. SuperCab and Crew Cab XL variants, of course, will gain folding rear seats. The XLT ought to return with standard 17-inch alloy wheels, cloth upholstery, chrome bumpers, full power accessories, including heated power-adjustable outside mirrors, cruise control, an integrated trailer brake controller and carpeted floor mats. Basic Ford SYNC voice-activated infotainment should also be delivered with this up-featured trim level, as should a single-CD player with 4 speakers. SuperCrew and Crew Cab configurations, finally, also should sport lockable rear under-seat storage. Getting into some heady territory, amenities-wise, the 2014 F-250 Lariat should continue flaunting 18-inch alloy wheels, a power sliding rear window with defroster, premium leather upholstery, front bucket seats, power-adjustable front seats, power-adjustable pedals and digital keypad power door locks. Then there’re likely such convenience features as a standard auto-dimming rear-view mirror, rear parking sensors and a rear-view camera, while dual-zone climate control keeps things cool, and upgraded leather and simulated wood cabin accents soothe the ride. Eight speakers, satellite radio, a video monitor, a USB port and a memory card slot, meanwhile, return to spiff up the entertainment offerings, while folks can keep in touch with Bluetooth hands-free calling. The King Ranch ought once again to offer standard stuff like standard power-folding tow mirrors, memory for driver's settings, remote engine start, unique exterior and interior badges, memory-card-based navigation and trim accent upgrades, while the Platinum should toss in standard 20-inch alloy wheels, cooled front seats and a heated steering wheel, as well as further decorative exterior and cabin bling. Lower trims in the 2014 F-250 Super Duty lineup likely will remain eligible for many of the standard features in the higher trims as optional equipment, with the XL and XLT additionally in line for Ford’s available Work Solutions Package with its in-dash computer technology. The optional FX4 Off-Road Package no doubt returns to the Lariat trim level with all-terrain tires, descent control, skid plates and beefed-up Rancho shock absorbers, while a power sunroof ought to be available to the higher trim levels, along with a hard-drive-based navigation suite that can be incorporated into the upgraded SYNC system, as can MyFord Touch technology. Of course, a spray-in bedliner, a transmission power takeoff with auxiliary switches (for operating, say, snow plowing equipment), a stowable bed extender, tubular side steps and heavy-duty alternators should also remain optional to this big truck, depending on the trim level. Noteworthy standard safety features gracing all F-250 Super Duty variations likely will remain 4-wheel antilock brakes (ABS), traction and stability control, front side-mounted airbags and front (and rear in SuperCab and Crew Cab editions) head airbags. A post-collision safety system should also grace each trim level, while the XLT and higher trims will likely retain a standard remote antitheft alarm and SYNC emergency assistance communications and services. Lariat and above trim levels, meantime, should again flaunt standard turn-signal-integrated mirrors, front fog/driving lights and dusk-sensing headlights. 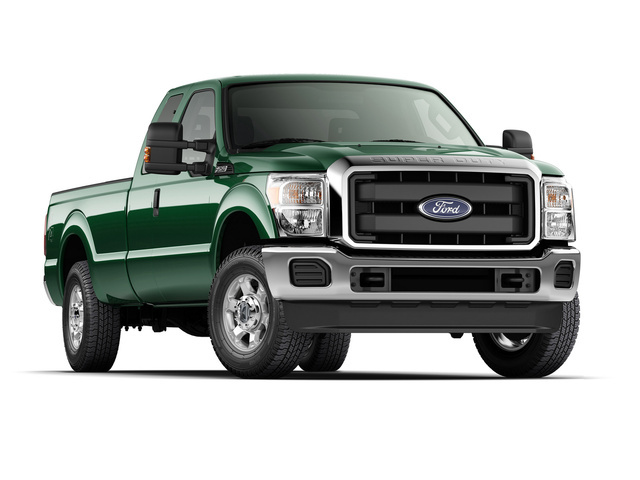 What's your take on the 2014 Ford F-250 Super Duty? Users ranked 2014 Ford F-250 Super Duty against other cars which they drove/owned. Each ranking was based on 9 categories. Here is the summary of top rankings. 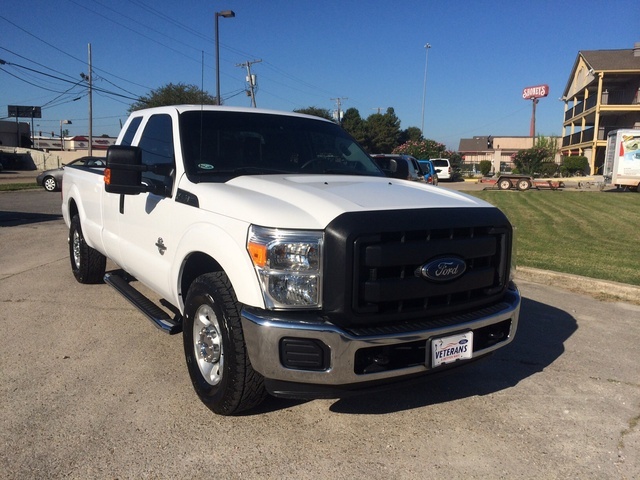 Have you driven a 2014 Ford F-250 Super Duty?